One of the things I love about Montessori spaces is that there is not a one-fits-all approach to designing spaces. Each Montessori space is it's own unique entity designed to fit the needs of the children using the space. A Montessori space can be created any where, on any budget. And, it makes every one interesting to explore! And, I can't get enough! So, I have to share! 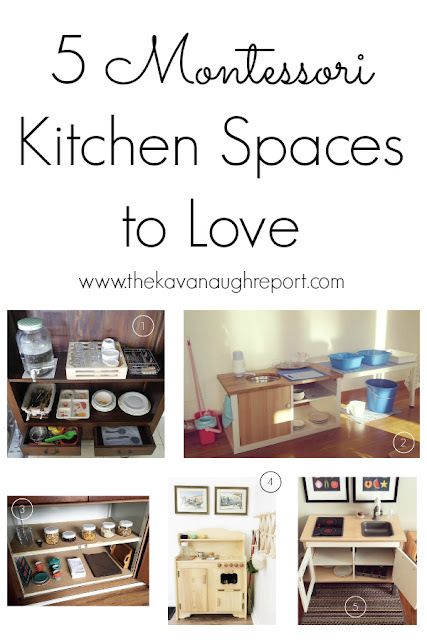 Here are 5 Montessori kitchen spaces to love! Each one has it's own unique flavor and set up. 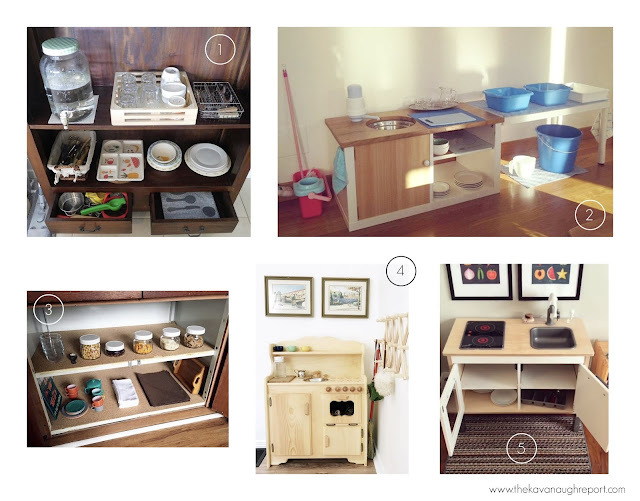 Each of these are from Instagram where I could spend hours looking at Montessori spaces! Melissa's kitchen space is just lovely! I love that it's built on a shelving unit but still completely accessible. I also love the water source solution, how empowering for her boys! Rachanchan Pedagoxia Montessori's kitchen is just dreamy in all this natural light! Again, a wonderful water source and lots of working space! Amy at Midwest Montessori's kitchen cabinet is what self-service food station dreams are made of. I love how every detail has been so carefully considered to make it perfect for her children. Jillian's kitchen space is what Montessori dreams are made of. It's the perfect example of using a play kitchen for real, productive work. I love the choice of cups and pitchers too! Hilary's kitchen is also a great example of using a play kitchen for real work. This is such a sweet little video of it in action! Do you have a Montessori kitchen space for your children? Have you seen our Montessori kitchen? Or our kitchen tools?